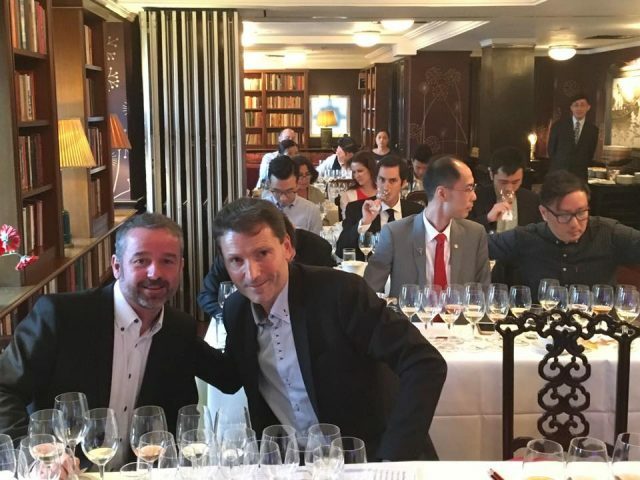 A recent masterclass held in Hong Kong’s historic China Club, hosted by Champagne Asia, set out to introduce the trade to two renowned but very distinct grower Champagne producers from the Côte des Blancs, Pierre Peters and Vilmart & Cie. Starting with Vilmart & Cie, which has been estate bottling since 1890 in Rilly-la-Montagne, the fifth generation proprietor, the gentle-mannered Laurent Champs, introduced the audience to his ‘Grande Reserve Premier Cru NV’, which he described as a “paradox” because of its high Pinot Noir content of 70%. His second wine, the ‘Grande Cellier Premier Cru NV’, by contrast, is 70% Chardonnay and a blend of the 2011, 2012 and 2013 vintages. A slightly lower dosage of 9g/l also led to a crisper, more elegant style. Moving onto the Blanc de Blancs wines of Pierre Peters, the exuberant Rodolphe Peters explained how every year is a “blank canvas” for the estate, owing to the “transparency” of the Chardonnay grape. “It can take on many different characteristics depending where it’s grown,” he said. His first wine, the ‘Blancs de Blancs Cuvée de Reserve NV’, is a blend of more than 20 harvests with 1988 being the oldest and 2013 the youngest and comprising around 50% of the blend. “We use no oak, only stainless steel and press very quickly after picking to retain that freshness. I love how the Chardonnay has conveyed the minerality and this wine to me, is the very image of our estate and what we’re trying to do,” he said. Moving onto the ‘Reserve Oubliée NV’, which Peters described as his Cuvée de Reserve, “that spent an extra year in tank”, it excellently highlighted Peters’ distinctive winemaking style where he keeps a portion of each year’s reserve wine and adds it to his solera over decades. For his Oubliée, the base is 2007 but the reserve dates back to 1988.